Chalkboard invitations are all the rage right now and if you ask me they make for an adorable invite for baby's first big shindig. If you're planning to invite friends and family to share in your delight as you reveal whether your baby bump is a he or a she, you're going to fall in love with these unique and trendy gender reveal designs. Of course they aren't really made of chalkboard but they sure do look like the real thing. I prefer the dusty black chalkboard invites so that's what I'm featuring here today. Each of the following comes with a white envelope and a 100% satisfaction guarantee. 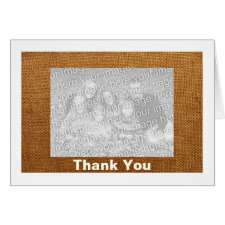 They measure 5" x 7" and they're printed on your choice of high quality card stock. With basic being the least expensive and highly recommended by me. They're all easy to personalize too! Click each one to learn more. Sporty modern Team Pink or Team Blue theme with a fun bold mix of typography. Chalk illustrations and fun fonts in different styles on a blackboard background. Modern and sporty gender reveal party invitations featuring cute onesies. There's more to see too. Visit Chalkboard Baby Gender Reveal Invitations to browse more. Or see our handpicked selections for seasonal baby gender reveal invites HERE. It's so much fun to carry the chalkboard theme across the entire party. Pick up some inexpensive boards at your local dollar store and use them for decorating by adding fun quotes, or use a large one to keep score while playing games at the party. You'll need some pink and blue chalk too! A large one can also b used to greet guests as they enter, as a menu board and to let guests 'sign in' and leave a message for baby. Heck, you can even do your big reveal using a chalkboard that you write on at just the right moment! Will you be having a chalkboard themed gender reveal party for baby? Share your best ideas for making it unique and fun for everyone. in the comments here. We love hearing from you. By now, most people already know how great the site Pinterest is for saving images and articles that they'd like to revisit. If you've never been, Pinterest is a haven for collecting visual images found online. It's highly populated with crafting, recipes and party ideas of all kinds. If you're planning a shower, Pinterest is a great place to store ideas and best of all, if there's more than one party planner, you can all work together to collect ideas onto one board. To add friends all you have to do is edit the board and invite them using the 'who can pin' function. You can even select to get an email when someone pins something new so you'll always be up to date with their latest finds. You should start pinning immediately, as soon as you know you're going to be planning a shower but it's best to be picky about your pins. You see the only 'problem' I've found with this fun site when party planning is that it's easy to get crazy and start pinning everything you see. Yes, there's a lot of great stuff but if you're using the site to plan a baby or bridal shower, it's best to create one board just for that purpose and be really picky about what you pin there. Go ahead and make another board or boards for the rest of the wonderful stuff you find. Use the search to find exactly what you're looking for. You'll be amazed at how much useful stuff you'll find. so quickly. Follow fellow pinners who have already created a board you like. If you're not a crafter, don't pin a bunch of DIY invitations and favors, find ready made ones instead. When choosing pins, take a moment to click through until you arrive at the original site the photo was taken from to make sure you can find the information or product you'll need later. It should take two clicks to get to the original site. The first click will take you to a larger image at Pinterest. The next click should take you to the original post. Trust me, it's no fun finding the perfect appetizer for your party and later finding out you can't get to the recipe. Save only what you plan to use. It's okay to delete pins if you decide later on they aren't going to be useful. If you get really picky while pinning for your shower, you'll have everything you need, exactly when you need it at the touch of a button. Do you use Pinterest for party planning? Have you created a board for a shower already? Have you got any great pinning tips to share? Share your best Pinterest ideas or a link to your baby or bridal shower board here in the comments so we can all take a look. 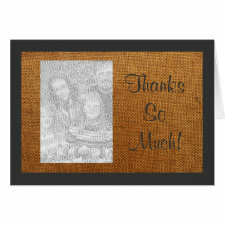 It seems people are using burlap for just about everything these days. Crafty people are making everything from home decorations to greeting cards. If you're planning a rustic themed party, you can use burlap in a million different ways to decorate, wrap gifts, and of course for your invitations and thank you cards. And speaking of thank cards, here's a neat collection that can be personalized with a photo and used to show your appreciation for just about anything and for any occasion including baby and bridal showers. or to personalize and order yours today. Easily upload a photo to the front and add a personal message inside. Cards measure 7" x 5" and come with a white envelope. Please note that these are NOT made with real burlap. 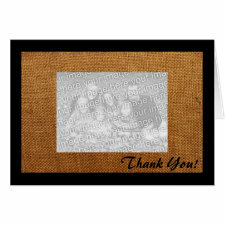 They were created using a photo image of burlap making them much easier and less expensive to mail than actual burlap cards would be. All of the above thank you cards were created by yours truly. Yes, I can get creative every once in a while. If you enjoy getting crafty, take a look at this tutorial for making burlap gift bags for your party favors. I found a fun video that teaches how to make burlap gift bags. These can be customized and used to wrap thank you party favors for any occasion. Just thought I'd pass it along for anyone who's interested. Bur...lap dog. Sorry, I couldn't resist. Which is your favorite style? 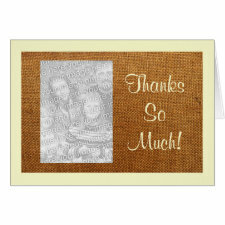 What would you use these Thank Yous for... baby shower... bridal shower... another occasion? Tell us in the comments here. Huge thanks to the fine photographers who made their work available to us through a creative commons license. We appreciate you! Click each of our featured photos to see the original source. Are you looking for Baby Gender Reveal party invitations with a more modern look? Or maybe you want something a bit more exciting than the traditional pastel pinks and blues? Here you'll find 10 bright and colorful gender reveal party invitations that might better suit your taste and style. Our collection of unique gender reveal invites feature bright pink and blue, along with purple and green and yellow and well... a virtual rainbow of colors for you to choose from. Take a look! All of the featured invitations are brought to you by the fine artists who keep shop at Zazzle.com, a world leader in unique high-quality custom and personalized products. Square invitations measure 5.25" and require additional postage when mailing. 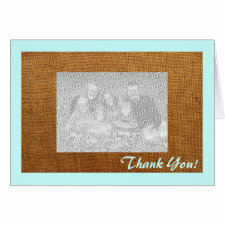 Rectangle invitations measure a large 5" x 7". Pricing will be determined by your choice of card stock and I can vouch for the basic paper being a fabulous value with dynamic results. Didn't find the perfect Gender Reveal invitation for your party? Browse everything for a Baby Gender Reveal Party including custom postage, stickers, buttons and more! Share your most unique and fun ideas for a Baby Gender Reveal Party here!